Dave Penner, Ph.D., is a licensed clinical psychologist and was the Clinical Director of The Gottman Institute from 2005 to 2017. He is the author of the Leader’s Guide for Teaching the Seven Principles for Making Marriage Work, based on teaching John Gottman’s Seven Principles book to couples for over a decade. 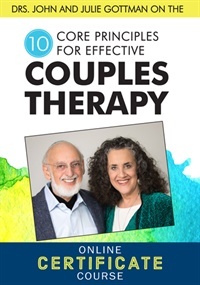 From these experiences, he co-developed the Seven Principles for Couples Leader Training Program and has led workshops training clinicians and lay leaders in the Gottman Method in North America, Australia, Europe, and Asia. In his role as the Clinical Director, Dr. Penner managed clinical aspects of the Institute, including providing consultation to Certified Gottman Therapists and clinicians in training; selecting and training consultants for clinicians pursuing certification; training and supervising video reviewers who certify therapists in the Gottman Method; training and supervising roving therapists at couples workshops; overseeing quality control of new programs and products; and answering clinical questions from clinicians, researchers, the media, and the public. Dave has practiced for over 35 years as an individual and couples therapist working in private practice, university, mental health and hospital settings.